Should you ask a doctor, or someone that knows? Sometimes a doctor does know. Of course, if a doctor is caught prescribing anything that is not a drug or FDA approved, he/she may lose their license to practice. Big Pharma did not get big by selling seeds, herbs, extracts, or other creations of God which may be free or even considered a weed. Cancer cells can only invade an acidic system. Eat healthy, avoid GMO’S, avoid SOY, CORN, SUGAR, etc. There are many things that can help. Internet searches find apple seeds, peach pits, bananas, and dozens of other things can actually help. How many herbs, oils, and ointments are specifically mentioned in the Bible? Anise, caraway, cardamom, cassia, coriander, fennel, fenugreek, garlic, mustard, onions, poppy seed, saffron, sesame and thyme to name a few. And other herbs used for cooking were basil, chervil, cumin, coriander, dill, marjoram, mint, oregano, poppy seed, savory and tarragon. Some identify Keneh bosem with the English and Greek cannabis, the hemp plant. One thing that is completely undisputable is that the human body, like all mammals, has many cbd receptors. How did they get there? God put them there. If you don’t believe in God, just neglect to use cbd oil for your cancer and you will find out for sure soon enough. 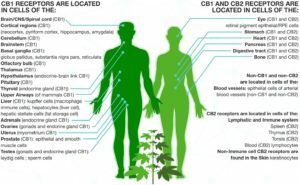 The only purpose of these cbd receptors is to aid the immune and other systems of the body when cbd is found. Major disclaimer: I am not a doctor and do not pretend to be. I am not promising you anything. I might ask you to ask God for your self and see what He says. If you don’t communicate with God, I suggest you try it. In Jeremiah 33:3 God says: Call to me and I will answer you, and will tell you great and hidden things that you have not known. Search Google for cbd medicinal benefits and you will receive results in the millions. Chemo can kill anything. Even you. CBD Oil is an extract from a plant. You can’t get high and it is legal in all 50 states. There are videos and web sites aplenty about cbd oil. Personal testimonies are abundant. But, remember this: All cbd is not created equal. Only one company as of this writing has government tested and certified product. That company is My Daily Choice. Research on the Hemp plant was illegal for a long time. Now that universities and many others are discovering how truly complex this plant actually is, new and exciting details are being published every day. Do your own research. It might save your life. If you are wondering why hemp is no longer on the controlled substance list with dangerous drugs like heroin and why people are demanding medical cannabis all across the country, and world for that matter, it is because it works. Has been proven to work. And the truth can not be kept hidden forever. Documentation, testimonials, scientific journal entries, and medical industry recommendations are beyond the scope of this article. I simply want to get you looking in the right direction. And when you discover, as I have, that this is something you need on hand at all times, you may also be interested to know that affiliates are earning a fair amount of money by spreading the word and helping other people to become aware. You can take a free tour of the business to see if you would like to be an affiliate.